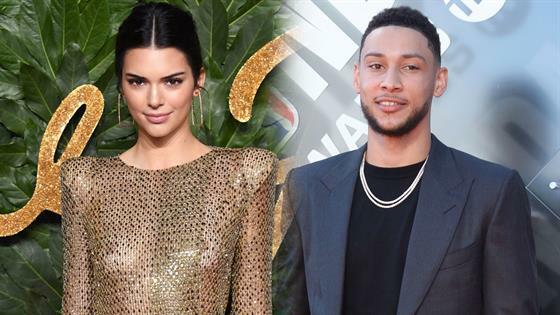 Kendall Jenner was back to cheer on her beau Ben Simmons courtside, and this time brought sister Kourtney Kardashian along. The two watched his team the Philadelphia 76ers take on the Los Angeles Lakers at Staples Center on Wednesday night. His team won 121-105. Kendall and Ben had first sparked relationship speculation last May and the duo went on to have a summer romance. In late August, E! News learned that things between the two had "cooled off." In recent months though, Kendall and Ben reignited romance rumors. They have flirted on social media and she has attended many of his basketball games, including with his mother. After Wednesday's game, Kendall, Kourtney and Ben joined two other friends for a late dinner at Craig's restaurant in West Hollywood. The group arrived and left together and sat in a booth, where they enjoyed some bottles of wine with their meal, an eyewitness told E! News, adding that Ben and Kendall "showed a lot of affection at the table" and "sat closely next to each other and kept leaning in to whisper and cuddle one another, while enjoying their drinks together." "It was definitely apparent they were a couple," the eyewitness said. "Kendall had a huge smile on her face and looked really happy. Her and Kourtney kept cracking jokes and were the life of the table. Kourtney was in a great mood. She seemed relaxed and very casual." Kendall and Kourtney were not the only celebs spotted at the 76ers-Lakers game. The sisters cheered on Kendall's beau Ben Simmons of the Philadelphia 76ers. The Laker-loving couple are all smiles. The Laker fan is spotted sitting courtside. The actor and comedian cannot contain his joy. The real-life Bohemian Rhapsody couple enjoy date night. The DJ cheers on the Philadelphia 76ers. Sitting beside her husband, the Beverly Hills, 90210 alum doesn't look too happy by what's going on on court (the Lakers eventually lost). Also seen among the crowd: Ashton Kutcher and wife Mila Kunis, Bohemian Rhapsody co-stars and real-life couple Rami Malek and Lucy Boynton, and Leonardo DiCaprio.